[WEEKEND SPECIAL] 272 Diodes, FDA Cleared Laser Helmet for Thinning Hair Loss Treatment for Men and Women. Light Stimulates Hair Follicles for Thicker Hair Regrowth. Why Choose the illumiflow Laser Cap? The illumiflow Laser Cap is a Class II Medical Device that has been FDA-Cleared for 100% safe and effective use in the treatment of hair loss using the heavily researched and clinically-proven technology of Low Level Laser Therapy (LLLT). It is currently the most cost-effective 272-diode FDA-Cleared Laser Cap available on the market. ** Unlike fraudulent alternatives which have bypassed the critical step of having their devices cleared by the FDA, illumiflow Laser Caps are meticulously regulated, heavily tested throughout the process of manufacturing, held to exacting quality standards, and backed by a Satisfaction Guarantee for ultimate user safety and peace of mind. 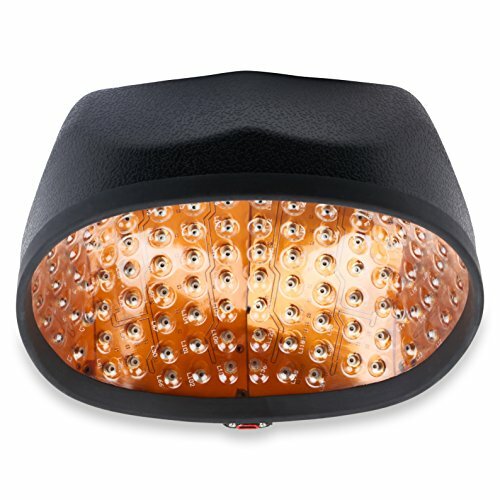 Our full coverage laser cap reaches ALL of your problem areas at once for maximum hair growth. Unlike devices manufactured with LED lights, our carefully calibrated lasers penetrate the scalp, effectively reaching the base of hair follicles during a short 20-30 minute treatment window in order to strengthen, rejuvenate, and re-grow your hair. FDA 510(k) CLEARED - illumiflow Laser Cap is THE ORIGINAL OTC (Over-the-Counter) Solution for MEN & WOMEN, cleared by the FDA for safe & effective use in the treatment of hair loss. In fact, other brands, like GrivaMax, even used OUR clearance to gain their own! BEWARE OF DANGEROUS FAKES - Don't be fooled by unsafe medical products. A better price doesn't always mean a "better deal". Spare yourself the risk of harm or fraud by ensuring that the product you are considering has been cleared for use by the U.S. Food and Drug Administration (FDA). CLINICALLY PROVEN TECH - Proven out by decades of research and literally thousands of clinical studies, LLLT is right for you if you've experienced thinning hair, a receding hairline, or hair loss, and can even help you get ahead of hair loss if you have a genetic disposition toward it. 100% SAFE, PAINLESS, AND EFFECTIVE - The LLLT technology featured in our Laser Cap is suitable for both men and women, presenting a non-invasive and affordable alternative to hair transplants and surgery. It is 100% safe, totally painless, and it actually works! ABSOLUTE BEST VALUE - 272 premium laser diodes provide an effortless and completely pain-free experience without the added expense or inconvenience of office visits or prescription requirements. Put your mind at ease with a solution that is not only affordable, but actually WORKS. If you have any questions about this product by illumiflow, contact us by completing and submitting the form below. If you are looking for a specif part number, please include it with your message.